Kasser Rassau Gallery Presents Prestigious Contemporary Indian Paintings | Marbella Marbella – Adelante! 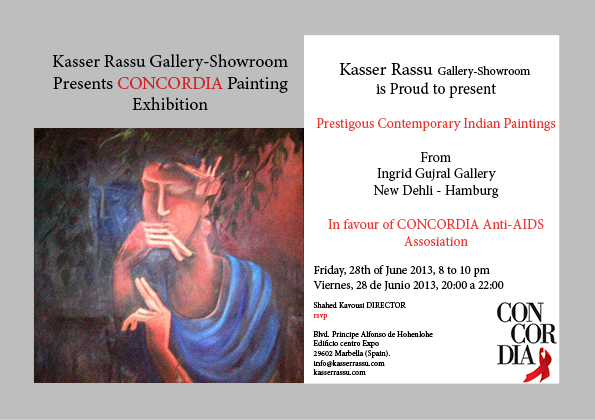 We are proud to present Prestige Contemporary Indian Paintings from Ingrid Gujral Gallery -New Delhi @ Kasser Rassu Gallery In favor of CONCORDIA Anti-AIDS Association! 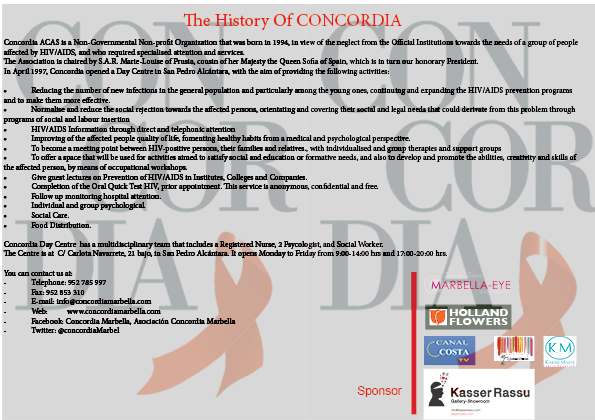 Concordia ACAS is a Non-Governmental Non-profit Organization that was born in 1994, in view of the neglect from the Official Institutions towards the needs of a group of people affected by HIV/AIDS, and who required specialised attention and services. The Association is chaired by S.A.R. Marie-Louise of Prusia, cousin of her Majesty the Queen Sofia of Spain, which is in turn our honorary President. · Reducing the number of new infections in the general population and particularly among the young ones, continuing and expanding the HIV/AIDS prevention programs and to make them more effective. · Improving of the affected people quality of life, fomenting healthy habits from a medical and psychological perspective. · To offer a space that will be used for activities aimed to satisfy social and education or formative needs, and also to develop and promote the abilities, creativity and skills of the affected person, by means of occupational workshops. · Give guest lectures on Prevention of HIV/AIDS in Institutes, Colleges and Companies. · Completion of the Oral Quick Test HIV, prior appointment. This service is anonymous, confidential and free. · Follow up monitoring hospital attention. · Individual and group psychological. Concordia Day Centre has a multidisciplinary team that includes a Registered Nurse, 2 Psychologist, and Social Worker. The Centre is at C/ Carlota Navarrete, 21 bajo, in San Pedro Alcántara. It opens Monday to Friday from 9:00-14:00 hrs and 17:00-20:00 hrs. We hope you join us at this Special Event! Looking forward to seeing you there / Esperamos verles pronto !